The canopy covering the Nade is called Namaskara Mantapa.As the name suggests ,the place is used for offering Namaskar or obeisance to the Lord.Many devotees also perform “Angapradakshina” or rolling on the ground around the inner round starting and ending at the Nade – the emotion of this seva being total surrender to the Lord Almighty. On Mahapanchami day during the annual Shashti festival nearly a thousand women and young girls gather here on empty stomach early in the morning and perform Angapradakshina They take a vow that if their wish for a success in exams,a life partner or a cure from some chronic ailment is fulfilled they would offer this Angapradakshina in Manjeshwar temple on Mahapanchami Day..This session is exclusively for women and is regulated by special women volunteers..After completion of this session men are allowed inside to perform their Angapradakshina.. The Nade as well as the Pradakshina Path are also maintained in its natural form . No cement or tiles are used. Only cowdung is applied as a disinfectant. This practice is being carried on for centuries.The rainwater from the roof of the temple is considered sacred and is let into the ground.This specially created seepage is believed to keep the snakepaths below the ground level (emanating from the Ruvvani ), cool. 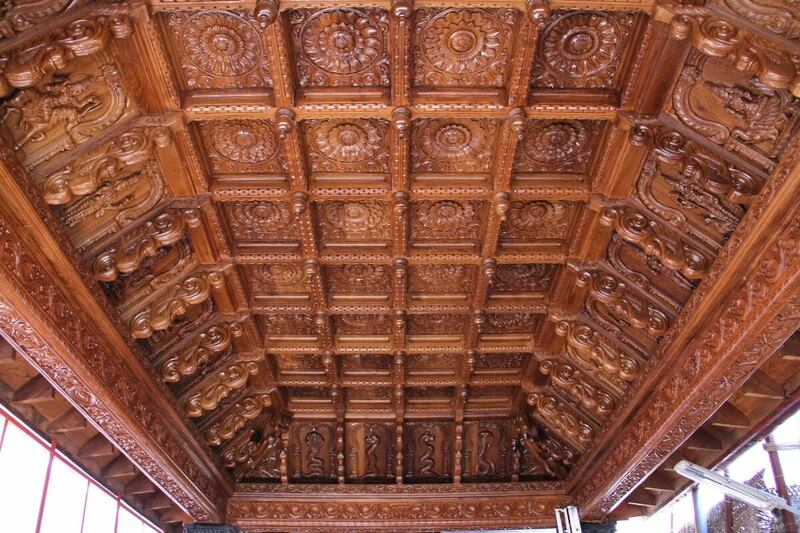 Prior to 1951AD,the Namaskara Mantapa was made of thatched roofing supported by arecanut treetrunks. This was being erected practically every year. In 1951 with the advent of RCC ,a permanent structure was raised on 8 RCC pillars and with high ceilings. It was also made broader to cover more area for the benefit of devotees. This structure had become weak .The Vastu experts also felt that a new design which is fully as per Vastu principles and which preserves the heritage image of the shrine is called for. Accordingly the structural engineers and the Stapathi suggested a new structure with granite and RCC foundation over which stand 8 black granite pillars brought from Tamilnadu. 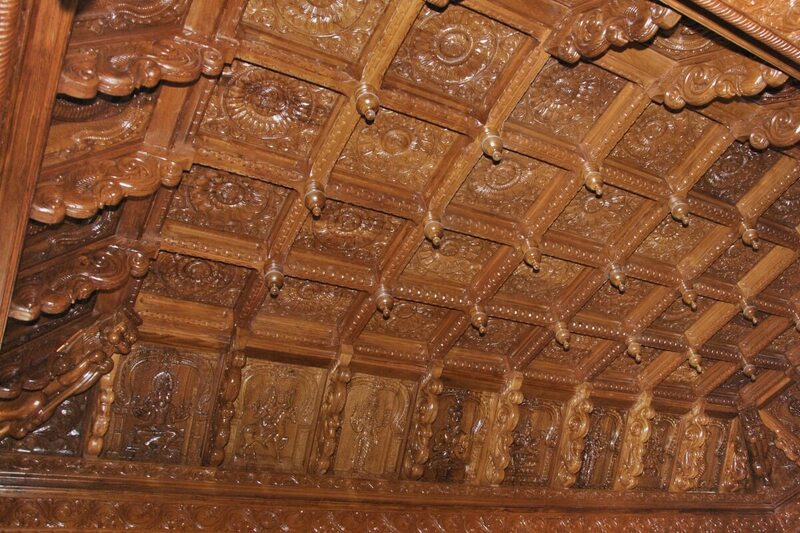 The upper and the lower carved portions are made from Karkala Granite.Above this is a formation made from 10 carved Teak beams which link all the pillars. The roof made from the same teak has two layers . The top one is designed to carry the copper roof cover. 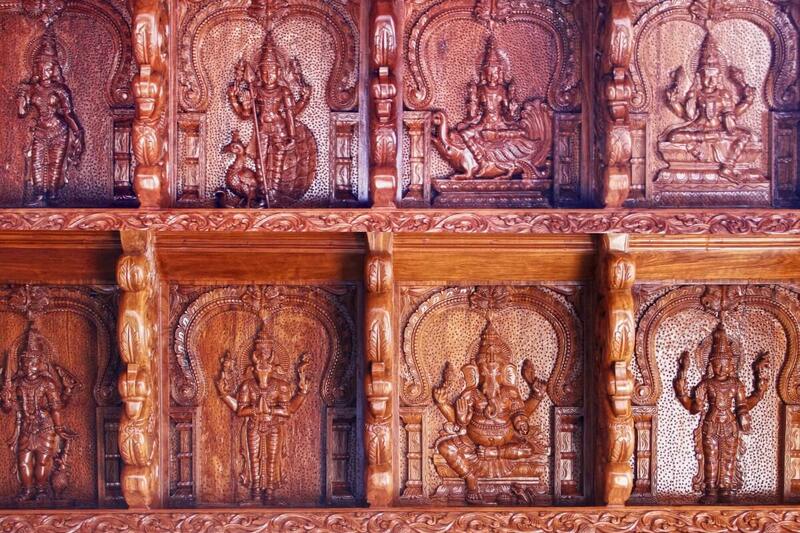 The bottom one is to give the Mantapa a gracious look with intricate carvings. 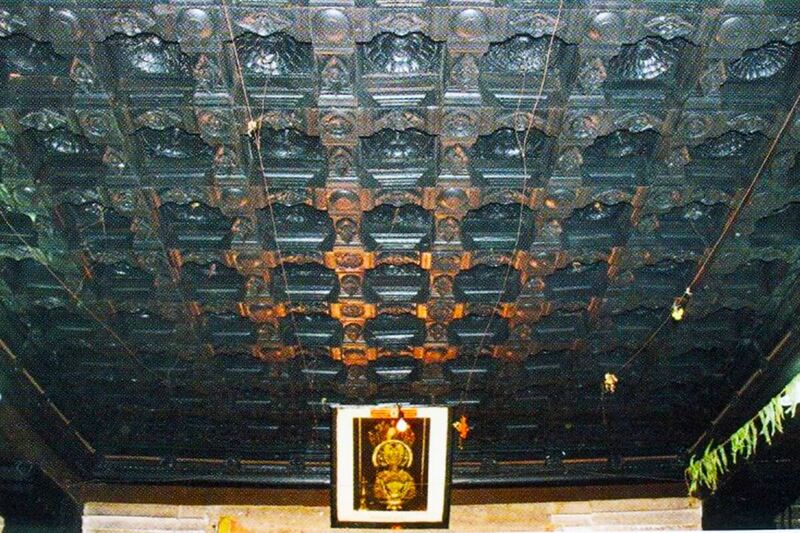 The Namaskara Mantapa now has five Shikhara Kalashas as specified in Vaastu Shastra and were installed ceremoniously on 27th April 2011 simultaneously with the Kalasha Punarpratishta of the Sri Garbhagriha. Now, the temple has in all-9 kalashas as against 4 earlier. It was our wish that the carvings on Namaskara Mantapa should reflect the true nature of this shrine which is a combination of three different paths in Hinduism being followed in the same Sanctum.The temple belongs to the Vaishnavite Gowda Saraswat Brahmanas and therefore follows the Vaishnavite rituals as guided by Sri.Kashi Math Samsthan. Hence the temple has a predominantly Vaishnavite Character with Sri.Bhadranarasimha as presiding Deity. At the same time ,the Shaiva roots of the shrine are indisputable . It is believed that Lord Parashurama himself anointed the Srimath Anantheshwara Linga This counts among the 108 Shivalingas consecrated by Him.in the Westcoast known as ” Parashurama Srishti”The temple which bears the name of the Deity. Srimath Anantheshwara (also called Manjarisha) from which the name Manjeshwar is evolved. The Naga worhip is an important part of the cultural and religious heritage of the western coast of India..It is borne out from the Skanda Purana that one of the first Naga idols was brought to Manjeshwar by Sri Ranga Sharma from Kushasthali in Goa.The worship of an anthill right inside the Sanctum proves that the practice of Naga worship has been followed from ancient times in the Manjeshwar temple. Therefore, the challenge for designers of Namaskara Mantapa was A) To capture the true nature of the shrine and depict the various deities adequately.B) Deities not visible to the devotees (being hidden behind the Simhasana)are depicted on the Mantapa in Murthy (Idol)form in order to create awareness among devotees.C)The new design should preserve and enhance the sanctity and dignity of the most sacred NADE of this ancient shrine.D)Provide full roof above the Nade from the Hanuman shrine extending upto the Garuda Shrine,there by providing protection to Devotees and archakas. during rains. 3 parts: Therefore the Namaskara mantapa was divided into three parts. -The central portion, the left wing and the right wing. The central portion – The Central portion above the Nade has the motifs of Ashtalakshmi namely: Adilaxmi, Dhanalaxmi, Dhanyalaxmi, Gajalaxmi, Santanalaxmi, Veeralaxmi, Vijayalami and Vidyalaxmi. 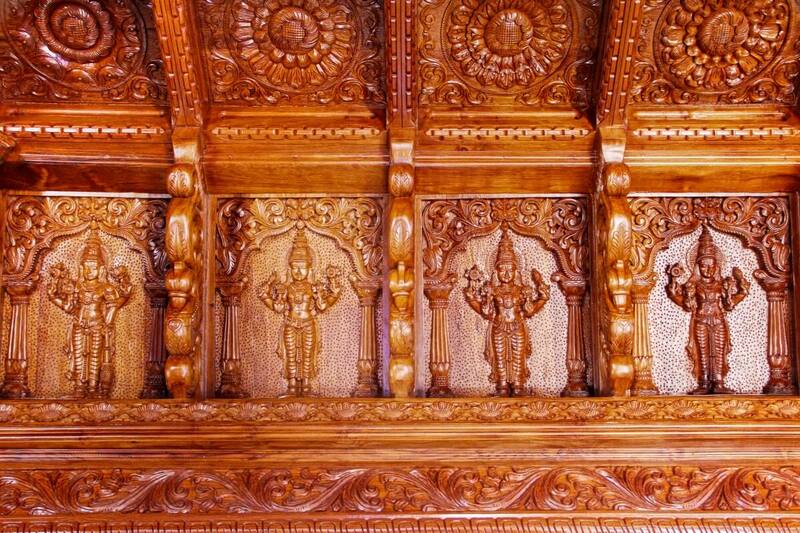 Traditionally,in Vaishnava temples the Laxmi motif is depicted above the main door. 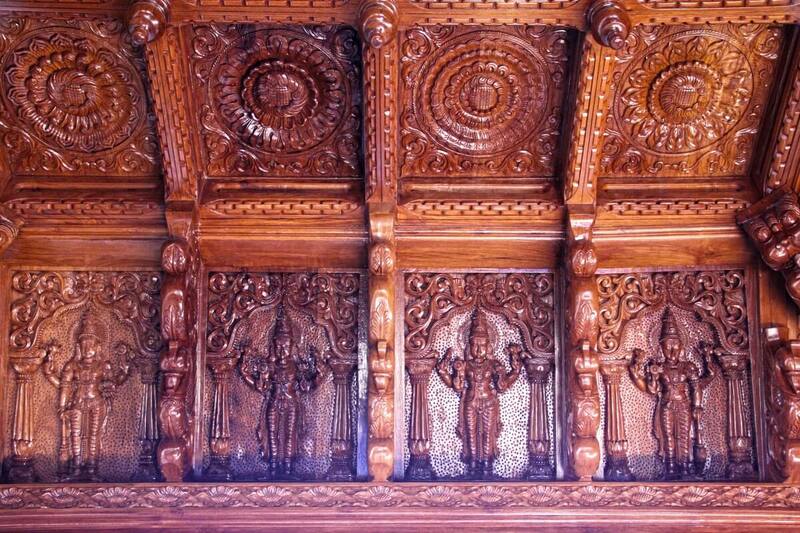 Right in the middle of the Ashtalaxmis is Sri Mahavishnu in a rare sitting posture on a lotus.All these nine Carvings are facing the Sanctum. On the front VIMANA (The topfront triangular façade) of the Sri Garbhagriha a silver carving of Shesha Shayana Vishnu (Mahavishnu reclining on the Mahashesha) accompanied by Sri Hanuman and Sri. 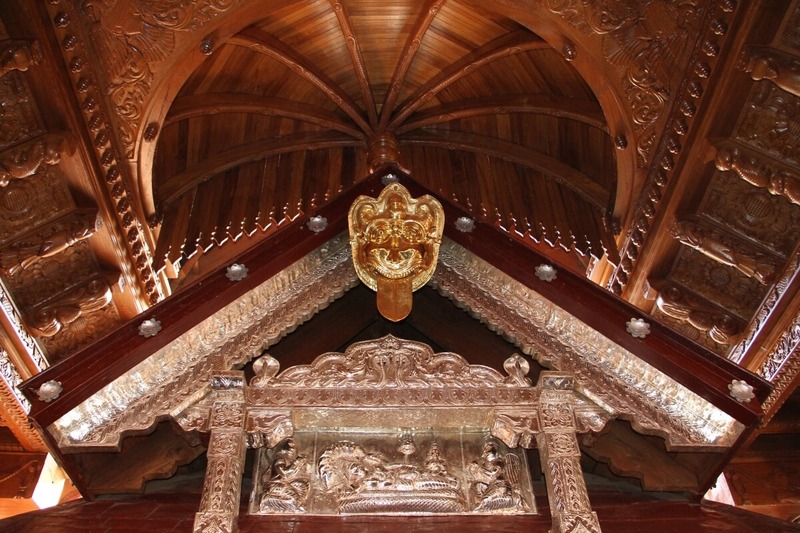 Garuda is depicted.This theme in wood sculpture was in existence since long.As the structure had weakened , it had to be re-done with teak as base and fresh silver work.The old Keertimukha is retained with a fresh gold coating. In accordance with Vastu requirement, the Namaskara Mantapa does not touch the main shrine . 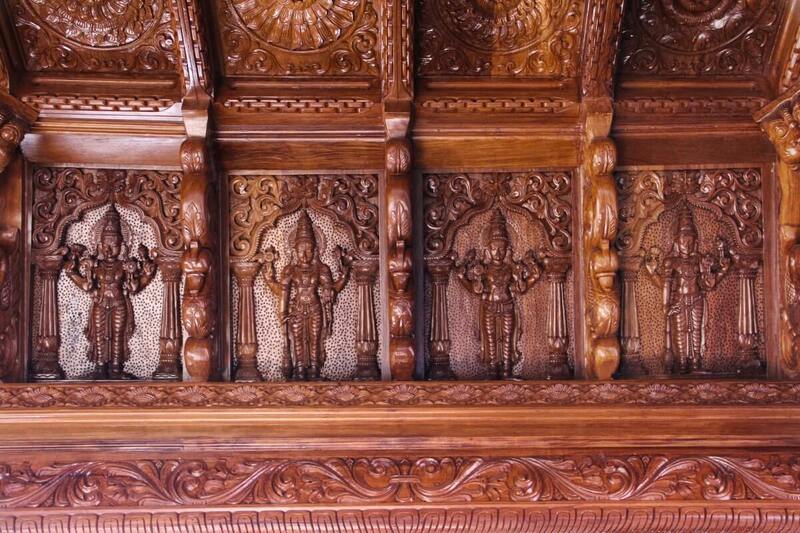 -The teak separators between the Ashtalaxmi carvings are interesting . They are called Gajapakshi(a Combination of an elephant and a bird). The Left Wing: The left wing of the Namaskara Mantapa now extends upto the Sri Hanuman Shrine and the Viniyoga Shakhe-enabling more protected area for movement of devotees and Archakas. “KESHAVADI” or the 24 descriptive names of Sri MahaVishnu are an essential part of every Vaishnavite ritual including the thrice a day Sandhyavandana ritual. Srimanmadhwacharya – The greatest among Vaishnavite Acharyas and propounder of Dvaitha Siddhantha in His book “Tantrasaara Sangraha” has described the features of Sri.Mahavishnu in these twentyfour forms. Noticeable are the way the 24 images hold the four Ayudhas–Shankha,Chakra,Gadaa and Padma.Each is different from the other. 4X3X2=24 combinations are used in which Sri.Vishnu holds the items(Ayudhas) in His four hands. The leftside of the Namaskara Mantapa depicts all these 24 forms .The first one Sri Keshava is on the southeast corner of the Mantapa where devotees offer Saashtanga Namaskar.This image is followed in clockwise direction by the other 23 images namely-Na rayana,Madhava,Govinda,Vishnu,Madhusoodana,Trivikrama,Vamana,Sridhara,Hrishikesha,Padmanabha,Damodara,Sankarshana,Vasudeva,Pradyumna Ani rudha,Purushothama,Adhokshaja,Narasimha,Achyu tha,Janardhana,Upendra Hari and finally,Srikrishna ending at the same corner. A devotee when he performs a Sashtanga Namaskar to the Sanctum also perfoms a namaskar to Sri Keshava simultaneously. He then gets up and does a Pradakshina while standing ,offers His namaskar to all the rest of the 23 forms and ends it near Srikrishna with another Sashtanga Namskar..It is noticeable that23 of the images have human face and only the Sri Nrisimha image has the face of a lion. We are grateful to H.H.Srimath Vidyadhiraja Teertha Swamiji- The Mathadhipathi of Sri.Gokarna Parthagali Math for His guidance in this matter. The one depicted on the Namaskaramantapa is the first one –Anugrahamurthy with His two hands in Abhaya and Varada posture. Other two hands are having a Mriga or deer and Damaru. He is accompanied byDevi Parvathi .The image depicts her milder aspect as Parvati or Uma with only two hands,the right hand holding a blue lotus and left hand hanging loosely with a red lotus. Their sons Ganapathi and Subrahmanya are on either side. Sri. Subrahmanya being worshipped in the Naga form in the temple is depicted here as a Murthy with his Vahana-the peacock.or Mayura Etymologically,the word “Subrahmanya”means”one who tends the spiritual growth of the aspirants”. Sri. Subrahmanya is one of the very important Deities of the Temple .The annual Shashti festival-the main Rathotsava(Car Festival) is mainly in honour of Sri. Subrahmanya. Frescura (Land of Coolness). The original temple of Sri.Mahalasa Narayani was built here. It was shifted to Mardol in the 16th century after it was demolished by the Portugese. Varunapuri presently has an extensive industrial area as well as a major Naval base .Incidentally ,the slogan of the Indian Navy is ”JAI HIND,SHANO VARUNA” The “Shano Varuna.” is from the Shantimantra- “Shanno Mitra Shamvarunaha…” from Rigveda. The motto of the Indian Navy is ‘Shano Varuna’ – meaning ‘May the Lord of the Oceans be Auspicious Unto Us’. We do not see today daily worship of Varuna in any GSB temples except in Manjeshwar Further research into this may lead to the time of the installation of Varuna thereby the exact period of the GSB settlement in Manjeshwar –which is for sure the oldest GSB settlement outside Goa.. Varunadeva`s vahana is described as Swans (Hamsa) or a crocodile (Makara) in different scriptures.In the Shilpashastra he is also shown as sitting on a combination of a crocodile`s face and a Hamsa`s (swan) body. Accordingly, it is depicted on Namaskara Mantapa. Kubera – next to Varuna is the image of Kubera. Kubera was king of Lanka. His cousins Ravana and Kumbhakarna defeated him and usurped his kingdom.Being a Shivabhakta Kubera did a severe penance (Tapasya) to please Lord Shiva. By Shiva`s grace he built a new kingdom near Kailasa the abode of Lord Shiva. He called it Alakapuri.He became the king of Yakshas.Kubera is counted among theAshtadikpalakas being in charge of the Northern Direction.He is known for his immense wealth and is worshipped as Lord of wealth. Lord Krishna in Bhagavadgitha –Vibhutiyoga said-“I am the Vitthesha among Yaksharakshasas.” Here,Srikrishna calls Kubera as Vitthesha-the Lord of wealth.Kubera was born a Rakshasa but later on became king of Yakshas.Hence the word- Yaksha-rakshasa. Being the Noblest among Yakshas and Rakshasas He is counted among the great Vibhutis(Manifestation of Divinity) enumerated by Lord Krishna. Importance of these Lingas-The most revered Devadarsan in Manjeshwar commences with a Pushpanjali(offering of flowers with both hands) to the Deities on the Simhasana followed by Teertha and Akshata(Holy water and rice) offering to the Lingas on the Ruvvani. behind the Simhasana.As these Lingas are hidden inside the Srigarbhagriha,most devotees are unaware of their existence . Therefore ,it has been decided to depict them on the Namaskara Mantapa in Murthy form in order to emphasise their importance. The East facing wing of the right side of the Namaskara Mantapa also has eight important Deities very relevant to the temple. -In the centre is Sri.Saraswati and Sri Vedavyasa. Devi Saraswati is playing Veena with her two hands. and holding a Japamaala (Rosary) and a book with the other two hands.Interestingly,Her head is slightly bent to show that she is engrossed in playing the music. The name -Saraswati strikes an emotional chord among Saraswats –a community which derives its name from the Goddess..The entire Saraswat community spread across the country and abroad speaking different languages and dialects have one thing in common-their erudite scholarship and almost 100% literacy. Knowledge ,education and integrity are the main strengths of this ancient group of people who find reference even in Mahabharata.It is Devi Saraswatithe presiding Deity of Knowledge and arts who has blessed the community with this unique distinction. and Talapadi rivers, roughly 12KMs. )She is also,the greatest among Mothers and the greatest among Goddesses. (Nadi tame,Ambi tame,Devi tame) In Manjeshwar Temple Saraswati Pooja is offered to a set of spiritual books over which is placed the idol of Sri Vedavyasa,on Saraswati Pooja day during Navaratri festival. Surprisingly, there is no Saraswati Idol in Manjeshwar. Therefore it was decided to provide an important place to Her on our NamaskaraMantapa. SRI. VEDAVYASA: “Muninaam api Aham Vyasaha”- I am Vyasa among the great Munis – said Lord Srikrishna in Bhagavadgitha when He gave examples of Great Vibhutis who were born with His amsha only. Sri.Vedavyasa is a central figure of Sanatana Dharma who divided the various Vedic Hymns into four different parts –Rig, Yajur, Sama and Atharva.Entire epic Mahabharata is his narration. .Srimadbhagavadgitha is a part of it. Sri Vedavyasa also wrote the 18 Mahapuranas and 18 upapuranas .Among these The Bhagawath Mahapurana isconsidered one of the greatest and most sacred texts among Hindu scriptures. Bhagawan Vedavyasa is considered an Avatar of Lord Vishnu. In Manjeshwar, the idol of Sri Vedavyasa receives daily poojas.in the Srigarbhagriha. He is also the presiding Deity in Sri. Kashi Math Samsthan. On the Namaskara Mantapa ,our shilpis have copied the Kashi math image of Sri.Vedavyasa. .Incidentally,the image on Namaskara Mantapa exactly faces the Manjeshwar Kashi Math. On the side of Sri Vyasa is the image of Maharudra. We have a separate Gudi for Sri. Maharudra behind the main Sanctum.wherein Sri Maharudra is worshipped in the form of a Linga.As per researcher Sri. Govinda Pai and Sri.Ganapathi Rao Aigal-The Maharudra Linga was inside the Sri Garbhagriha alongwith the other Lingas. For some reason a separate Gudi wasbuilt later on..This may be true because ,even nowthe Pradhana Archaka ,after performing pooja in the Sanctum Sanctorum performs pooja to the Rudrashrine despite the fact that there are two priests exclusively for the Pooja in Rudra Gudi. Maharudra has special significance during Devadarasana. Eyewitnesses who have seen Devadarsan have said that in the initial part of Darshana process the Patri spends some time in front of Maharudra interacting in sign language with the Deity.This is called 9 embedded granite stones . These are called Ganaas which were installed during Devadarsan when some spirits were liberated from people who were possessed .These Ganas have daily offerings from the temple.There are many more such Gana stones else where in the temple premises. In this image on the Namaskara Mantapa , Sri. Maharudra is shown in His Soumya Roopa (milder representation) with his two hands holding a Mriga(a deer)and a Damaru. The other two hands are in Abhaya and Varada posture. This image is followed by the image of VAAYU. The presiding Deity over vital air. Vayu acts inside the body as five major Pranas(Panchapranas) and five Upapranas.He is counted among the Ashtadikpalakas and is in charge of the northwest direction.(Vaayavya). A Brahmana is supposed to offer the first five morsels of food to the Panchapranas –Prana,Apana,Vyana,Udana and Samana, before he partakes his food. One of the most important Shantimantras in Rigveda includes Vayu among Mitra(Sun),Varuna, Aryama, Indra, Brihaspati,Vishnu and, Brahma and addresses him as “Twameva Pratyaksham Brahmasi.”- you are the visible God. Danda. Here,Vayu is shown with two hands. Adjucent to the image of Vayu is AGNI-the presiding Deity of tejas,fire and heat. The religion of the Vedas being mainly centred round sacrificial rites, Agni the God of fire naturally gets the pride of place in the Vedic Hymns. He is even praised as the creator,sustainer and the all pervading cosmic spirit. He acts as the mediator between men and Gods by carrying sacrificial offerings (Yajna) of men to Gods. Yajna is a very important ritual in Sanatana Dharma. These can be Nitya(Daily),Naimittika (Occassional) Or Kamya (With an objective or motivated). 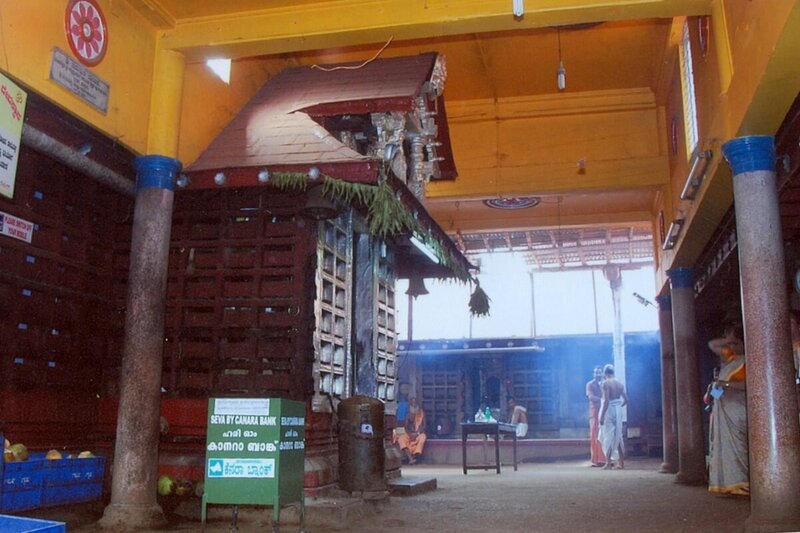 In Manjeshwar temple yajnas are quite frequent. Everytime the Yajna has to be performed,, Agni is invoked as He is the link between men and Gods.The Panchratryagama –the 5day long Yajna is the most important Yajna in Manjeshwar temple held once a year during the annual Shashti festival.-A Gana stone is installed on the outer periphery of the temple in front of the Maharudra Shrine. This is the biggest Gana stone in the temple premises and is called AGNI GANA. This location is used by the Devadarsana for driving out the most adamant spirits from the possessed people. Also, during Manjeshwar Devadarsan , one of the most important Sevas is lighting of lamps around the temple-called Deeparadhana. In Skanda Purana it is written- “one who lights these lamps during the Devadarshan (Also called Sheshotsava) gets rid of his past sins. And the one who re-lights the extinguished lamps with devotion receives the benefit of getting rid of all his worst sins even from previous births instantaneously” Even in the absence of Devadarsana ,thousands of these lamps are lit on nine important days of the year during the Utsava. Hundreds of devotees rush to light these lamps and complete the process in ten minutes. Agni in iconography, is shown as an old man with a red body. He has two heads, a big belly and six eyes and seven arms, seven tongues ,four horns and three legs His vahana is a ram.He has two consorts-Svaha and Swadha.He carries in His hands spoons,ladle,a fan etc. Agni as shown on the Namaskara Mantapa is drawn from Kashyapa Shilpa Shastra. On the left hand side of Saraswati is the image of SURYA–the Sun God. SAVITR –is the aspect of the sun before sunrise.He is golden all over.He gives life and energy and guides people in the right path. He is the sustainer of life on this planet.The sacred Gayatrimantra is dedicated to this Savitr.Surya is first among the Navagrahas. Men worship Him daily during Sandhyavandana. Married Saraswat women worship Him during Shravana month with colourful bouquets called Choodi. The powerful Adityahridaya Stotra is in praise of Surya. Sri Rama could vanquish Ravana only after He recited the stotra. Iconographically ,Surya is depicted riding a chariot pulled by seven horses (Perhaps signifying the seven colours of the Sunlight).The charioteer is Aruna .In shilpa shastra He is also shown in a standing position without His chariot.In two hands, he is holding a red and a blue lotus.The other two hands are in Abhaya and Varada postures.The Namaskara Mantapa has this image of Surya. One of the poojas in the temple on fullmoon days is called “KALABA”. This is a monthly purification ceremony of Shatakalasha.after which a ritual called Nireekshana is performed. A number of nature`s creations like rice,fruits,dryfruits,betel leaves etc are placed in the Nade and rays of Sunlight (SURYA ) are directed to the Sanctum as a final purification ceremony by Surya Himself. So, Surya has a direct role in temple rituals. Next to Surya is another important Vedic Deity the INDRA or Devendra. Indra is undoubtedly the chief Deity of the Rigveda. Even in Bhagavadgita ,Vibhutiyoga (10th chapter) Lord Krishna attributes excellence on three aspects of Indra .1) “Devanam Asmi Vasavaha”-I am the Vasava(Indra) among the Devaas.2)”Airavatam Gajejendranaam”-I am the Airavata among elephants.3)”Aayudhanaam aham Vajram”-among armaments I am the Vajraayudha. So.Krishna says –Indra, His vahana- the Airavata and his armament –the Vajrayudha are all having HIS amsha. Hence,Indra can be called the very embodiment of excellence.He is also the Dikpalaka in charge of the Eastern Direction. No yajna is complete without offerings to Indra. -On Namaskara Mantapa Indra is shown in all His glory riding His Airavata and holding the Vajrayudha His Consort Indrani is sitting behind Him. The NAVANAGAS – “Anantaschasmi Naganaam-I am Anantha among Nagas””Sarpanam asmi Vasukihi” I am Vasuki among Sarpas-said Srikrishna in Bhagavadgita. Naga worship in India can be traced to the Vedic times. Sri.Subrahmanya is depicted in the form of Naga. In Samaveda it is said-’Brahma eva Subrahmanya” Subrahmanya is Brahma Himself. In Puranas and Mythological literature,Vishnu is reclining on Shesha or Anantha naga,in the ocean of milk,Siva wears a snake all over His body as ornament, Ganapathi wears it as Yajnopavitha (sacred Thread) and uses another as belt ,His brother Subrahmanya himself takes the form of a Naga. During Samudra Mathana Vasuki is used as a rope to churn the ocean. The Yogagurus describe the Kundalini Power to a coiled Serpent. The most powerful Nagas are called Navanagas. They are Anantha,Vasuki,Karkota,Takshaka,Padma,Shanka Or Shankapala, Gulika,Shesha or Dhananjaya and Mahapadma.In some literature Anantha Himself is described as Shesha.Anantha is described as the Supreme among the Navanaagas. In Manjeshwar temple during Devadarsan the Deity that the Patri carries is that of Nagaroopi Subrahmanya also called Shesha..The Devadarasana is addressed in its invocation shlokas called “Aveshashtaka “as –Phaneesha. During Nagapanchami the main Pooja is to the Ruvvani or Rohini the Anthill inside the Sri Garbhagriha, worshipped as Vasuki. So it is called Vasukipooja.Outside ,on the Nagakatte are hundreds of Naga idols installed by devotees. Thousands gather on Nagapanchami irrespective of caste or creed. and offer pooja to these Nagas. Navanagas depicted in temple art. The first attempt is made in Manjeshwar Temple.The first Naga – Anantha being the chief Naga is depicted facing East alongwith major Deities like Indra Surya,The other eight Nagas are depicted facing South and North, four in each direction. Each of these are capable of granting different boons to Devotees. But the most important of them are Anantha and Vasuki (Vasuki with seven hoods is shown next to Anantha facing the South) Anantha and Vasuki are essentially capable of granting children to the childless. While Anantha grants female children Vasuki grants the male. Almost daily, devotees throng the Manjeshwar temple to pray for progeny and many of them comeback to thank the Deities having fulfilled their wishes. The emblem of Manjeshwar temple is the seven headed Naga.The Devadarsan Patri`s jewellery has Naga motifs.The pillars of the Namaskara Mantapa are beautifully carved with the motifs of serpents with one,three ,five or seven hoods.Th inner Vasanthamantapa and the Yajnashala has silver Mahasheshas on which the Utsava Deities are seated..The most sacred Teertha in Manjeshwar is Shesha Teertha..Naga is undoubtedly the most visible identity of the Kshetra. Thus ,an attempt has been made to show all important aspects of the ancient shrine on the Namaskara Mantapa in a picturesque way.A small handbook is published to guide the devotees in locating these carvings and understanding them. They share the success of the Glorious New Namaskara Mantapa : The Srigarbhgriha Jeernodhara Samithi is thankful to The Stapathi- Respected Sri Mahesh Muniyangal, Engineer Sri.Narendra Prabhu,Darushilpi Sri. Sripathy Acharya and his team from Dakshina Kannada, Rajasthan, and UP, Rajatha shilpi Sri Dhnanjaya Acharya and his team from Dakshina Kannada. Sri Jathanna from Sowmya Wood Works, Mangalore,who monitored the carving of images of Deities executed by shilpis from Tamilnadu .We are thankful to Sri Appuraya Kini,his main sculptor Sri. Gudigara and his team from Tamilnadu and Karkala who coordinated the Shila shilpa of the pillars.We are also thankful to M/s Airodi Radhakrishna Pai for the Copper roofing and M/S Govardhan Metals for the Kalashas for completing the job in a very tight schedule. We gratefully remember the thoughtful services by Sri Manohar Nayak-Director-“Canara Bank sponsored C.E.Kamath Institute for Artisans,Karkala” for giving us access to their library on Shilpashastra and also for arranging useful meeting with his staff.We are also thankful to Vedamurthy Sri. SudhakarBhat–Pranshupala,Sri Nigamagama Pathashala,Mangalore for providing the book –Tantrasara Sangraha by Srimath Madhwacharya (Kannada version By Sri. Bannanje Govindacharya).We also gratefully remember the gesture of elder devotee Sri.Gurpur Vasudeva Prabhu ,who provided rare information on Navanaga.and Sri.Subrahmanya.We are guided by Our Acharya –Vedamurthy Sri Purushothama Acharya particularly on temple rituals and their significance We also thank our advisor and former trustee Sri.M.Sunil Bhat for his inputs on Sanskrit Scriptures and also other matters. The erection of the Namaskara Mantapa was totally manual and no crane or JCB has been used. Erection of the heavy granite pillars was accomplished mainly with the help of Karasevaks from Manjeshwar (Both men and women) with technical guidance from the shilpis. The wooden beams from car street were hauled by Karasevaks from Manjeshwar and Manchakal.We remember with gratitude the excellent coordination by our vice president Sri Nitinchandra Pai in the execution of the erection work. We are grateful to Sri. G. A. Rao and his brother Sri. G. D. Rao from Evergreen Engineering Company, Mumbai for donating the lighting system. We are especially grateful to all the donors who organized funds for the Namaskara Mantapa as and when required.